Missouri has many great fly fishing streams such as Current Creek, Crane Creek and the North Fork (White River) to name a few. These rivers have great populations of Rainbow and Brown trout, and many of the fish are above average size. Access to some of these streams can seem a bit limited but they are well worth the effort of getting to them. I only picked a few of the states rivers to spot light, but there are many more to choose from. This is a great fly-fishing state centrally located in the middle of America. 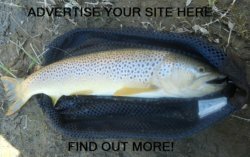 Next time you are traveling through the show me state bring your fly-fishing gear and stop by and try a few of their streams. Be sure to check the fishing regulations for each stream before fishing. There is a link below for regulations and licensing. Also check out the map at the bottom of this page to see where these amazing streams are located. Located in the southwest corner of the state, Crane Creek is one of the states best fly-fishing streams. The stream is small in size but the fish are not. The fish are wild Rainbow Trout, not just any trout; these are McCloud River Rainbow trout first introduced in the 1880’s. Read more about each of these rivers by clicking their link. You will find a hatch chart and map of each. The North Fork River located near Tecumseh, near the Arkansas border is a big river with many big Brown and Rainbow’s. 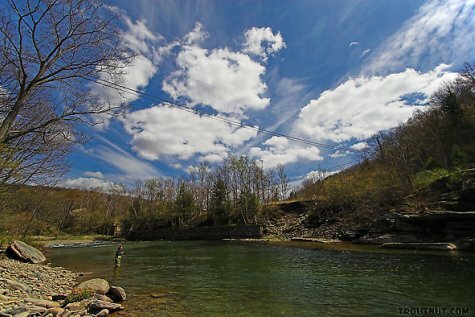 The best fly-fishing water begins below Double Springs and continues seven miles to Patrick Bridge. There is good fishing upstream from here, but this is the blue ribbon section of the river. The Current River located near Montauk State Park has some of the bigger fish in Missouri. The nine-mile stretch of river between the park and Cedar Grove Bridge is a blue ribbon trout stream. If that is not enough, there is an eight-mile stretch of white ribbon fly-fishing below this stretch. You can’t ask for much more than that. Is this the best stream in the state? Read more about Current Creek. Missouri is a great page to fly fish, click here to choose another state.